Gallery wraps are something that I just started offering this year (along with Madera Custom Portrait Albums and Madera Wedding Albums) and I wanted to blog about them because I think they are just fantastic (I have several around my house - mostly of the dogs of course!). This is a gallery wrap canvas that I ordered to display in Itsy Bitsy Boutique in North Liberty, the size on this one is a 20x24. 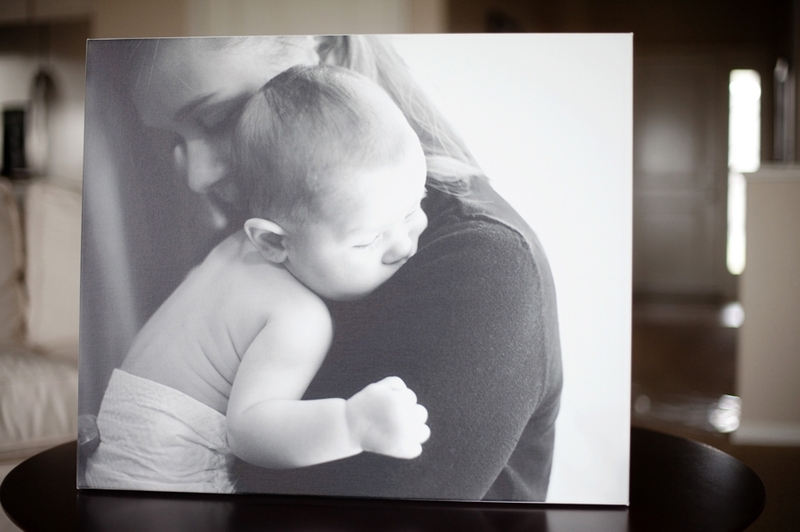 The photo is printed on canvas, giving the image a bit of texture as you can see in the image below, and is wrapped around a 1.5" width wooden stretcher frame. I love these because they are ready to hang, saving you money on custom matting and framing. The image can wrap entirely around the frame, or what I commonly do since I tend to take photos with a tight crop, is a white or black border on the edges (which you don't see when looking at the photo straight on). The wrap below just has a white border on the edges. People often are unsure about what size might look best in their home, I think the following is a great reference (though you could always do multiple photos for a gallery wall if you want more than one image). 11x14 works for a very small wall space or in a series of portraits grouped together on the wall. 16x20 looks great on a small wall or over an end table or shelf. 20x24 works nicely over an armchair or loveseat. 30x40 looks amazing over a sofa, fireplace, dining room table, or bed. Here's a great reference photo with some of the larger options to give you a visual.